Researchers at the US Department of Energy's Oak Ridge National Laboratory (ORNL) came up with an innovative large-scale graphene fabrication method. The scientists used CVD to create 2-inch-by-2-inch sheets of graphene, contained in a polymer composite. 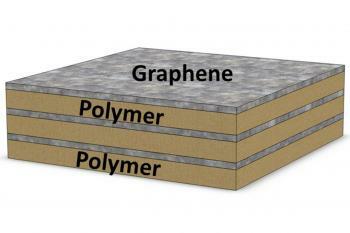 Layering graphene between polymer sheets is meant to facilitate use in commercial products, according to the scientists. Common approaches to polymer composite fabrication use graphene flakes, creating flake dispersion and agglomeration problems. This method, however, uses graphene sheets that eliminate these problems and allow for better electrical conductivity with a lower graphene content in the composite. In fact, the scientists claim that they were able to make a nanocomposite laminate that is electrically conductive with graphene loading that is 50 times less compared to other samples.